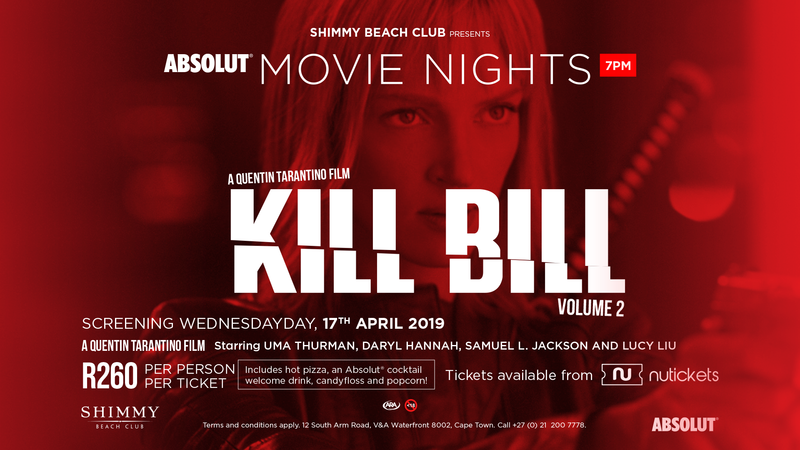 Shimmy Beach Club's Absolut Movie Nights is back this April with the screening of the Tarantino favourite and cult classic, Kill Bill VOL 2. The Absolut lounge will be transformed into an indoor cinema and warmed up for the occasion with heaters, blankets and comfortable lounge come cinema-style seating, creating a cosy, relaxing atmosphere for Absolut movie-watching bliss. Tickets are priced at R260.00 and will include an Absolut Vodka arrival cocktail, Margarita pizza and the movie essentials… popcorn and old-fashioned candyfloss of course! Doors open at 18:30, movie starts at 19:30.